I’m a hopeful romantic, shhhh, that’s a secret only for you and me to know ;) Ah, well, perhaps it’s not such a secret, however, I do believe in the art of kissing. Leaning into an embrace, gazing into your love’s eyes and just melding into the moment as two souls dancing to the rhythm of time. In Jesus’ days a kiss was seen as the exchange of spirit as shared by Cynthia Bourgeault in The Meaning of Mary Magdalene. Above and beyond the romantic notions or spiritual connections, it’s no secret that kissing is good for the health, the top ten reasons to kiss include, but are not limited to: lowering blood pressure, decreasing cortisol stress hormone, increasing serotonin (feel-good hormone), reducing pain, increasing oxytocin (the love hormone), improves immunity, fights off cavities, increases dopamine, improves the mood, and lowers anxiety. 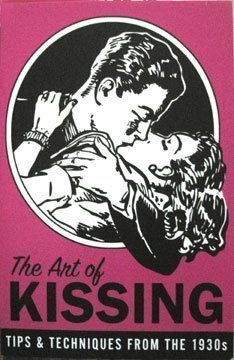 If you’re wanting a few pointers or new techniques I found this little book, The Art of Kissing: Tips and Techniques from the 1930’s, prior to Valentine’s Day in a local boutique. It’s chock full of ideas and guaranteed laughs while perusing this art of kissing vintage guide. “If we are to get the real meaning of the word kiss, instead of going to the old fogies who compile dictionaries, we should go to the poets who still have the hot blood of youth coursing in their veins” ~Pietro Ramirez Sr. If the health benefits or the promise of practicing the art of kissing do not move you to lip locked-bliss with the one you love, then the below excerpt from The Hourglass Door should help bridge the gap from indecision to lips in motion in kissing the midnight kiss. Happy Monday, now go kiss, seriously, your heart will thank you for it! I’m a romantic too! And that’s why there’s so many pictures and songs about kissing. That kiss is a true intimate moment especially if its with the one you love.